THE ONLY WAY TO GET YOUR LIFE BACK IS TO BE TOTALLY OPIATE-FREE! MMT (methadone medication treatment) with Methadone is used as replacement therapy for the opioid-dependent patient. Since Methadone is an opiate, the patient is still dependent on opiates with this replacement therapy. Once in the program, patients feel like they are locked in, not able to stop, and have to commit to driving daily to get their dose. Basically, it is trading one opiate for the other. Consequently, the patient will still be dependent on the opiate Methadone and will go through withdrawals when it is discontinued. Withdrawals are very painful and can last months after the last dose since Methadone is the longest acting of all the opiates and gets deposited in your bones and tissues. Rapid Methadone Detox under sedation is a medical detoxification treatment offered by All Opiates Detox for patients dependent on Methadone. It consists of sedating the patient and removing Methadone from the brain receptor while the patient is sleeping. Acute withdrawals are precipitated with an opiate blocker. These withdrawals will pass during the sedation period. Once the withdrawals are over, and the brain receptors are free of the opiate Methadone, a blocker is placed to prevent any opiates from getting back into the brain receptor. The blocker of choice used at All Opiates Detox is an implant. Dr. George prefers the Naltrexone implant blocker for several reasons. First, the Naltrexone implant lasts approximately two months, as opposed to Vivitrol (lasts approximately 28 days) or tablets (have to be taken daily). Another reason our physicians prefer the implant over the injection is for patients that may not be able to tolerate Naltrexone due to side effects, sensitivity or allergies. The implant can be removed from under the skin, whereas the injection stays in the body for about 28 days and therefore cannot be removed once it is administered. It is recommended to stay on Naltrexone maintenance therapy for at least one year to allow the brain to heal from the damage caused by the drug use and abuse. Methadone is an opiate used primarily as maintenance therapy in people with opioid dependence. Methadone is indicated for pregnant women who are addicted to opiates. Methadone is dispensed at clinics as a detoxification drug to get patients off their other opiates. The program is called MMT (Methadone Maintenance Therapy). Methadone dosing is done relatively fast, in less than a month, or gradually over as long as six months. Methadone accounts for over 25% of opioid poisoning since the continuous daily dose can take five days to reach maximum peak effects due to its slow onset of action. Once in the Methadone program, detoxing off of the Methadone is very difficult since it is a long-acting opiate that is stored in the bones and tissues. Commonly these include dizziness, sleepiness, vomiting, and sweating. Serious risks include opiate abuse and a decreased effort to breathe. There is a high risk that patients on long-term therapy or high doses of Methadone will develop prolonged QT interval which can eventually lead to abnormal heart rhythm. 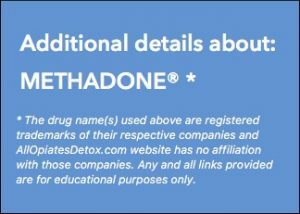 Methadone has the longest half-life of all the opiates, and thus withdrawals are reported as being more severe, more painful and longer lasting than all the other opiates. In addition to being the longest acting opiate, Methadone is deposited and stored in the bones and tissues. Patients have reported having symptoms of withdrawals even months after detoxing off of Methadone the conventional way. Physical symptoms of Methadone withdrawals include aches and pains in the joints and legs, dilated pupils, hyperventilation, diarrhea, nausea, vomiting, hypertension, photophobia (light sensitivity), tachycardia. Cognitive symptoms are more prevalent and severe with Methadone withdrawals and include agitation, anxiety, auditory and visual hallucinations, delirium, delusions, depression, insomnia, panic disorder, paranoia and suicide ideation. Methadone overdose symptoms include cool, clammy, damp and pale skin, opioid toxicity, stomach spasms, small pinpoint pupils, respiratory depression, hypoventilation, unconsciousness, coma or death. Methadone is an opiate so it can be abused on its own. Caution must be taken by the provider when dosing Methadone since it is the most potent and the longest acting opiate. When Methadone is abused, there is no such protection. Although Methadone does not cause the same euphoria (high) as heroin, the person abusing may feel high when they first start abusing it. As tolerance to Methadone is developed, more is needed to feel the euphoria. Using more dosage, in an attempt to get a rush or to get high, may lead to overdose and result in death. Improper use and abuse of Methadone can lead to dependence, tolerance, and addiction. Once the patient develops a tolerance, it becomes even more difficult to stop using due to the withdrawals. Symptoms of withdrawals are an indication of physical dependence and addiction to the opiate Methadone. Most patients describe withdrawals as the worst, most frightening experience one will ever encounter. One can only imagine the excruciating pain when the opiate user says that they’d rather die than go through the withdrawals. Methadone physical dependence symptoms, such as withdrawals, lead to psychological dependence. That is when addiction takes over the mind and life of the Methadone opiate user.